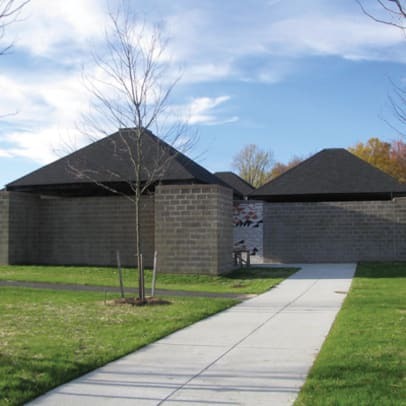 Opened in 1955, the Bath House at New Jersey&apos;s Trenton Jewish Community Center (JCC) is internationally renowned for its simple, yet emotive, design. It was a watershed moment in the career of Estonian-born architect Louis I. Kahn, who is widely regarded as one of the most influential architects of the 20th Century, mentioned in the same breath as Frank Lloyd Wright, Le Corbusier and Mies van der Rohe. Kahn&apos;s trademark fusion of Modernist sensibility with the design principles of the past is much in evidence in his design for the entrance to the community pool, which comprises five square concrete "rooms" with pyramidal roofs, arranged in a Greek cross plan around an open-air atrium. The complex was one element of an overall Kahn-designed campus, but the JCC proceeded with only his Bath House, the Olympic-sized swimming pool it serves, and the Day Camp (1957). Ultimately, the JCC chose the firm Kelly & Gruzen to design the community center building, which was completed in 1962. Strictly speaking, the complex is not a bath house, nor is it located in Trenton – but four miles outside in Ewing Township, Mercer County, NJ. While the final built version differs from Kahn&apos;s first design submissions in 1954, in which the pool was given primacy over the buildings, deceptively simple themes such as roofed spaces versus open spaces and clear patterns of circulation were constant from the initial drawings to completion. The wood-framed roofs appear to float above large concrete-block columns, introducing what Kahn termed as "servant" spaces to the rooms that are "served." The architect developed this concept further in his next major commission, the Richards Medical Research Laboratory at the University of Pennsylvania. Meredith Arms Bzdak, architectural historian and partner at Mills + Schnoering Architects (formerly part of Farewell Mills Gatsch Architects), notes that the Bath House eschews ostentation to remarkable effect. "Kahn created a very simple structure using rather unremarkable, even commonplace, materials – and yet the result is an incredibly moving, vibrant work that is at once thoroughly functional and completely responsive to the changing effects of light and weather," she says. "The Bath House is a work of architecture that is incomplete without its environment, and that is made whole by its setting and by nature&apos;s shifting moods. It is rare in this regard." Over the years, the Bath House underwent many changes. 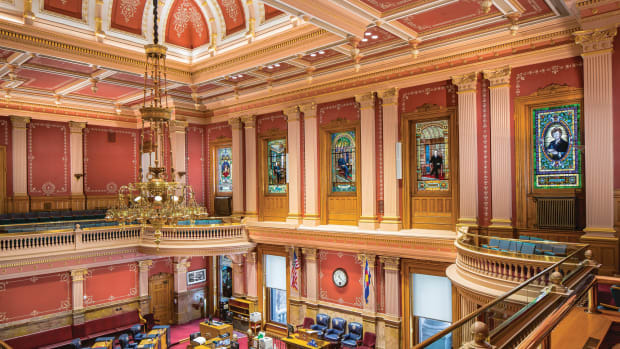 Among them were the addition of a snack bar along the exterior of the women&apos;s dressing room; the filling in of a circular gravel element in the central atrium; the painting over of the entrance mural; and the addition of foundation plantings. One of the most significant alterations to the four Day Camp pavilions was the replacement of terra-cotta flue tiles with stucco. The Bath House and Day Camp were listed on the New Jersey and National Registers in 1984 and on Preservation New Jersey&apos;s "Ten Most Endangered List" in 1997, when the JCC applied for a permit to demolish two of the Day Camp pavilions. By 2001, the remaining Day Camp pavilions had been shuttered due to significant structural degradation, and while the Bath House remained open, it too was threatened by poor drainage and general disrepair. With a grant from the New Jersey Historic Trust, the JCC retained Ford, Farewell, Mills and Gatsch Architects (FFMG) (later Farewell Mills Gatsch Architects and now Mills + Schnoering Architects) to complete a preservation plan for the Bath House and Day Camp. Before the plan could be implemented, however, the JCC announced in 2005 that it planned to relocate. 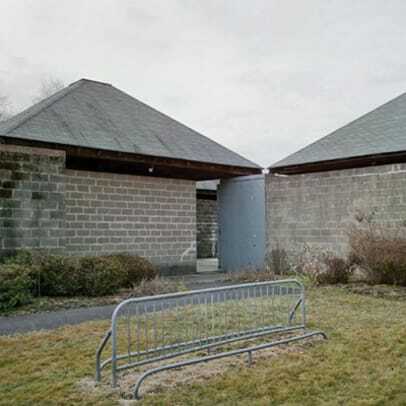 The Bath House&apos;s future hung in the balance until Mercer County, under the guidance of county executive Brian Hughes and director of planning Donna Lewis, purchased the property using funds from its Open Space Preservation Trust, and then transferred ownership to Ewing Township. With an updated preservation plan and an historic landscape assessment by Heritage Landscapes to guide the process, Kahn&apos;s long-term vision began to come into focus in 2008. The goals of the project were threefold: to repair and restore the Bath House; to reconstruct, based upon HABS documentation, the Day Camp pavilions; and to introduce landscape features intended by Kahn but never carried out, along with improved site access and a new picnic area and snack bar. All surviving Kahn-designed structures were structurally improved and weatherized, while all unsympathetic additions including a storage shed, fence and the existing snack bar were immediately removed. A $750,000 grant from the Garden State Historic Preservation Trust allowed for the removal and rebuilding of two Day Camp pavilions, reinstating the symmetry of the site. From the outset, history – recent and otherwise – posed challenges for all involved. Not only had the project come to fruition after a decade of uncertainty and transition, but it also required reaching across the decades to understand and honor Kahn&apos;s intentions, while adapting them for modern use. To do this with integrity was the biggest challenge of all, and often came down to luck or perhaps, Kahn&apos;s prescience. For example, the turning measurement between the walls at the entrance to the changing rooms was just right, to the inch, for a wheelchair. "The changing rooms are very cleverly designed without the need for doors," says Michael J. Mills, FAIA, partner at Mills + Schnoering. "Bathers enter the changing rooms by cubed corner &apos;rooms&apos; in which the exterior walls that face the atrium meet the support columns midway. They walk around, and pass out of sight without the need for enclosure. Once inside, natural light enters through a perimeter gap between the pyramidal roof and the sidewalls, giving a wonderful sense of openness." The discovery that Kahn had left enough space for a wheelchair to enter the changing rooms was a relief, but not entirely a surprise. "He was very forward-thinking," says Bzdak. "While we can&apos;t be sure that he designed with exactly this scenario in mind, Kahn was always ahead of his time and this is just another example." The main entrance was originally decorated with an 11 x 8-ft. mural painted by Kahn and his assistant Marie Kwo, which was later painted over due to water damage. Inspired by the mosaic floor of an ancient Roman site, the Baths of Caracalla, its angular and circular waves provide a striking welcome to the complex once more, thanks to Canning Studios of Cheshire, CT. The firm reproduced the mural using photos of the original, taken shortly after construction, and with colors determined from scientific analysis of fragments of surviving paint (performed by Jablonski Building Conservation, Inc. of New York, NY). Canning Studios first developed a full scale cartoon replicating Kahn&apos;s original design for the project team to review in place. Upon approval, the design was transferred to the building wall by the traditional technique of pouncing, whereby graphite is applied through tiny perforations that precisely following the design. With the resulting guidelines on the wall, Canning&apos;s artisans executed the mural in much the same manner as Kahn had, with one key difference being the use of "Optil" silicate mineral paint, supplied by Keim, to increase the longevity of the installation. Recently, Canning Studios was contacted by the Vitra Design Museum in Germany, and asked to create a replica of the mural as part of a Louis Kahn retrospective traveling exhibit, planned for 2013. For more information, visit http://www.design-museum.de/en/exhibitions/preview.html. Additional suppliers and craftspeople who contributed to the project included Filigree Systems, Inc., of Cranbury Township of NJ, (concrete); Clayton Block of Edison, NJ; and Sherwin-Williams paints and finishes. Lighting was provided by Kenall Manufacturing Company of Gurnee, IL, BEGA of Carpinteria, CA, Kirlin Lighting of Detroit, MI, Devine Lighting Inc.of Greenville, SC, and Emergi-Lite. Custom metalwork was by J.S. 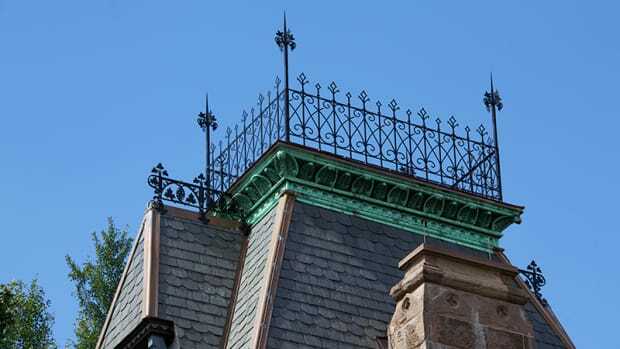 Welding, LLC of Montague-NJ, and roofing systems were by Versico of Carlisle, PA.
That Kahn&apos;s plans for the 40-acres surrounding the Bath House were never implemented has meant that, until now, the complex was partially realized. As Patricia O&apos;Donnell, principal of Heritage Landscapes explains, "There was no music playing." "Kahn was not only working with architecture, but with spatial geometries," she says. "He did not differentiate between landscape and structure, they were both built forms." 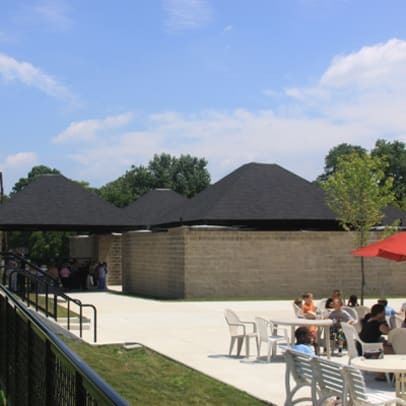 For the first time, Kahn&apos;s concepts for the surrounding landscape and amenities are in process, from the sympathetic new snack bar and terrace and upgraded pool deck, to the reconstructed Day Camp pavilions. In place of a shopping mall-appropriate asphalt parking lot, a Kahn-inspired community green has been created on axis with the Bath House and the Community Center, providing an appropriate forecourt and a new outdoor room that can be programmed for events. A perimeter ring road offers easy access to both buildings and to parking areas, which are organized in accordance with Kahn&apos;s intentions. And in keeping with Kahn&apos;s 1957 master plan, tree lines and bosque have been planted. Together, these elements create the outdoor rooms, processional spaces and edges that Kahn had in mind, and provide appropriate adjacency for his architecture. "We are very excited to bring forward a new setting," says O&apos;Donnell. "But this is not a restoration. What is really interesting is that these geometries are from Kahn&apos;s master plan, and meet contemporary community needs. We are creating a better setting that evokes the sense of place he envisioned."